Significant engine upgrades, new technology, ergonomic and styling improvements and a weight saving of 11 lbs add up to a Tiger built to take on every adventure with total confidence. Radically better off road you’ll immediately benefit from the all-new ‘Off-Road Pro’ riding mode, which is designed to turn off ABS and traction control for maximum off-road fun. All this comes on top of advanced core technology, including Triumph Semi-Active Suspension, optimized cornering ABS, and traction control, making the XCX a truly epic adventure bike. LIGHTER BY 11 LBS: Over 100 enhancements across the whole motorcycle (including a lighter flywheel, crankshaft, exhaust silencer, engine bars and battery) have resulted in an 11 pound weight saving over its predecessor to significantly improve handling and maneuverability. MORE POWERFUL AND RESPONSIVE ENGINE: The thrilling new generation Tiger 1200 XCx engine delivers more peak power (141PS at 9,350rpm) and maximum torque of 122Nm (at 7,600rpm), giving more immediate delivery and even better all-day road and off-road riding. STATE-OF-THE-ART TECHNOLOGY: In addition to the XR spec, a host of high value XRx features include Daytime Running Lights and LED lighting, full-color TFT Instruments, backlit new switch cubes and 5-way joystick, four riding modes and keyless ignition. RIDING MODES: The new XCx is ready to take on any challenge in every type of riding environment with its five riding modes ('Rain', 'Road', ‘Off-Road’, 'Sport', plus the new dedicated 'Off-Road Pro'). NEW WHEELS AND HIGH QUALITY TIRES: Better all-round capability; stylish all-black wheels with a 32-spoke, aluminum rim, front wheel fitted with Metzeler Tourance tubeless tires (front R19 x 3", rear R17 x 4.5") and optional handbook-approved off-road Pirelli Scorpion set-up. ERGONOMIC IMPROVEMENTS: Practical enhancements offer an altogether better ride for a wider range of riders and riding styles; including a more comfortable seat compound, and a new handlebar position to improve control both off-road and on. 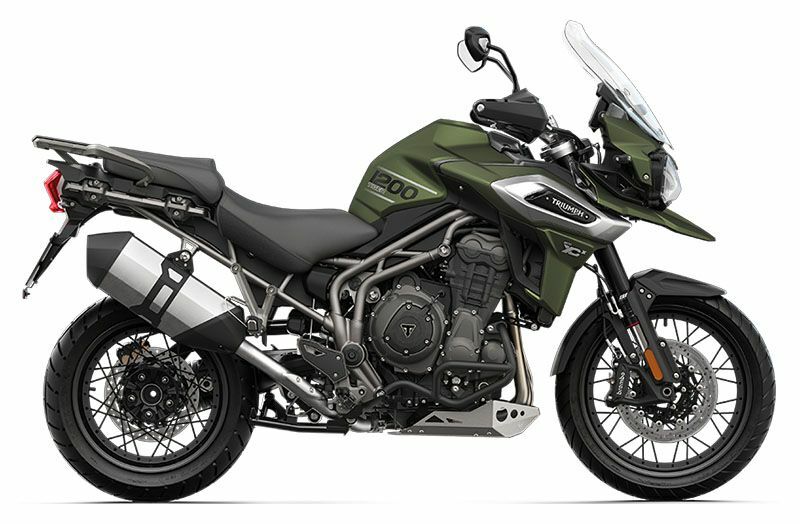 EVEN MORE TIGER STYLE: More contemporary premium bodywork and the highest-lever level of finish and detailing featuring premium graphics and finishes to enhance that muscular Tiger 1200 style. ADJUSTABLE SEAT HEIGHT: The Tiger 1200 XCx features adjustable ‘2 position’ seat mechanism allowing the rider to lower seat height by 20mm from 855mm to 835mm to suit their style and provide a more comfortable riding experience. 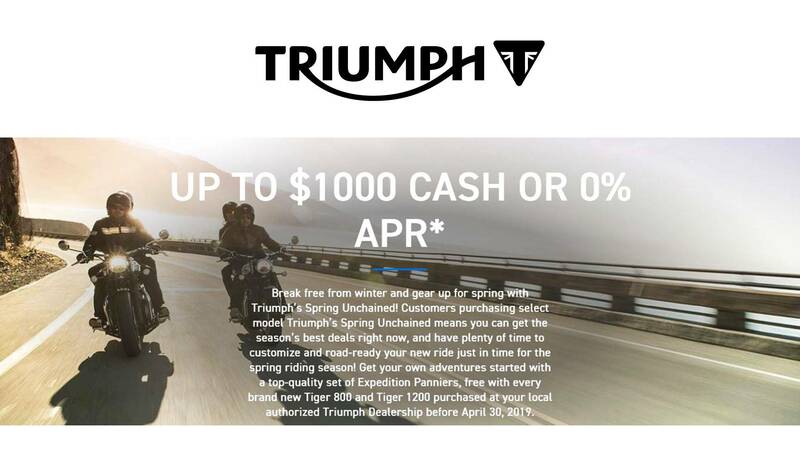 HIGH SPECIFICATION SUSPENSION: The XCx premium adjustable WP suspension is delivered by the Triumph Semi Active Suspension (TSAS) system which allows the rider to set a level of electronic control over how the bike reacts to the ride.